New People’s Army vows to fight, help oust Duterte | Fight Back! GRP Pres. Rodrigo Duterte foolishly and carelessly wasted the confidence and goodwill of the people of Southern Mindanao towards him when he bludgeoned the sycophantic Congress to extend once again the martial law in Mindanao and reinforce the current police state responsible for the mass murder not only in the island but in the whole country as well. The peasants, Lumad, workers and other oppressed masses who comprise the vast majority in the region placed good faith in his promise to initiate the much-needed land reform, national industrialization and end to US subservience. To the utter shame of Davaoeños and Mindanaons, Duterte is the drug-crazed monster and rightly called the country’s number one terrorist brazenly sitting at the Malacañang Palace. He should rightly be referred in the annals of Philippine history as the Adolf Hitler of the South, capable of exterminating millions of Filipinos should he continue to sit in power for the next four and a half years. It is his madman’s dream to place the country under a perpetual police state, desperate as he really is, to hold on to power as a US puppet and chief representative of his cronies of big bourgeoisie and landlord class in the country. His two recent edicts, Proclamation No. 360 which cancels the peace talks between the GRP and the NDFP and Proclamation No. 374 which declares the CPP-NPA-NDFP as terrorist groups, are the latest in a parade of legal absurdities, masquerading as strongman tactics. From the start of his term, it was he who sorely needed the peace negotiations with the NDFP in vain attempt to end the civil war in the country through surrender and pacification. That because he could not do so with mere words and not deeds, he now makes a show of pathetic shot to undermine the protocols and various agreements such as the JASIG and CARHRIHL, which have long been in place prior to his ascension. That because he could not thwart the long running armed revolution in the country, he daydreams he can do so by ordering the mass arrest and killings of purported communist members, supporters, and suspected sympathizers. Prior to foisting these legal monstrosities, Duterte has already exemplified his deep proclivity to rights abuse with the killing of nearly 15,000 mostly poor drug suspects nationwide; and in Southern Mindanao, the killing of 57 activists and members of legal democratic organizations, the aerial bombings affecting 7,600 individuals in military operations, displacing 13,800 farmers and Lumad. The extended martial law in Mindanao is not simply a diabolical deed to strengthen Duterte’s militarist rule; it is meant to insulate the glaring cronyism and bureaucrat capitalism intensified by Duterte’s own family that is gaining wealth with the planned pricey infrastructure projects in the island, such as the construction of Samal Island – Davao City Connector Bridge, the Agusan River Basin and Tagum – Libuganon River Basin, the P218 billion Mindanao Railway System and the Central Mindanao Airport. Still under the auspices of the neoliberal agenda, his much-ballyhooed Dutertenomics peddles the “Build Build Build” mantra for profit-hungry local and foreign business through increased foreign loans and private-public partnership. Fast-becoming Duterte cronies are oligarchs that corner the largest infrastructure projects in the country: San Miguel Corporation, Manny V. Pangilinan, and the Ayalas. Indeed, Mindanao’s martial law is not so much an anti-terror and anti-communist campaign but rather a smokescreen to railroad the unimpeded implementation of graft-laden projects—the same projects that will only result in disastrous financial burden for the people. The NPA in Southern Mindanao considers Duterte as a treacherous opponent to be fought zealously, without room for illusion and naïveté. 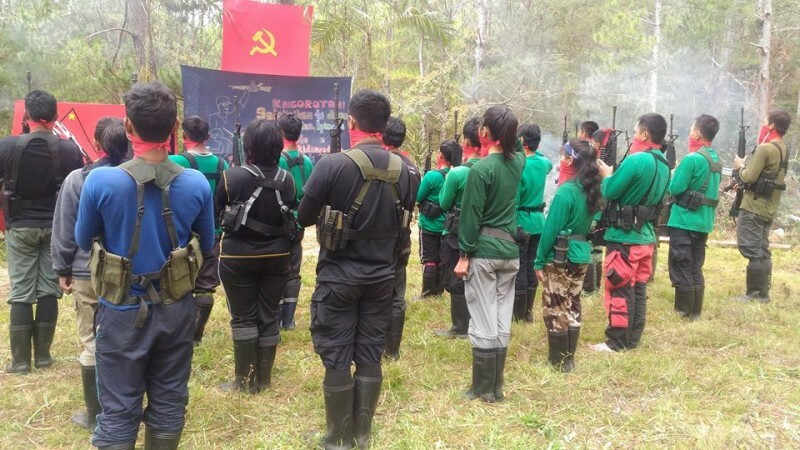 Since January this year, all NPA units in the region have launched widespread tactical offensives and intensified masswork and implemented the much-needed services in the countryside. The Red fighters in the region launched a total of 196 tactical offensives and 23 punitive actions from January to November 2017. The NPA actions rendered 215 casualties, wounded 162 soldiers and captured 8 prisoners-of-war from the enemy. A total of 139 firearms were also seized. Duterte has scoffed at the NPA’s track record to obscure the reality that the NPA and the People’s Democratic Government have persevered and made serious positive changes in the lives of the struggling farmers and basic masses for the last nearly 50 years. He parroted the line of his ardent bootlickers at the AFP and defense establishment to the point that he junked the peace talks using twisted facts of so-called “NPA atrocities.” The lies that he peddles are meant to invalidate the gains and advances of the revolutionary movement in the region and nationwide. Ironically, while he belittles and insults the NPA and the revolutionary forces, he has deployed two-thirds of his fascist armed forces in Mindanao and concentrated it mainly against Red fighters, proof that he wants to attain military superiority through mere numbers and high technology. The NPA in the region has persisted and prevailed over the Oplan Bantay Laya II and Oplan Bayanihan counterinsurgency programs of the Arroyo and Aquino regimes which targeted the region as their number one foe. The NPA in Southern Mindanao will not only continue to do so under the Duterte reactionary regime but will further help advance the people’s war throughout the country. The revolutionary forces are not deterred by the threats and escalating human rights abuses of the Duterte regime. They join the broad united front of all peace-loving citizens in the country to oppose and oust Duterte and install a government respectful of justice, genuine democracy and freedom.